Brown lamb shanks in a frying pan on all 4 sides. Peel carrots and parsnips and chop finely. Remove fibres from celery and chop celery finely. Peel swede and cut into 2cm pieces. Peel onion and slice finely. Peel and cut pumpkin into 1cm cubes. Place carrot, parsnip, celery, pumpkin, swede and onion in a slow cooker. 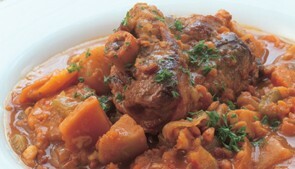 Place lamb shanks on top. Add King Vegetable Soup Mix and water.